your plants or trees outside of the pipe. 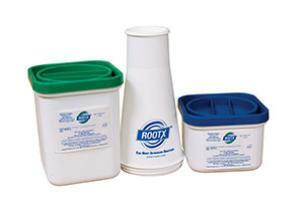 Rootx is EPA approved and is registered in all 50 states. application and be registered for Rootx one year guarantee. professionally apply it based on your application needs. Rootx can be used with or without mechanical root cutting equipment. replacing or repairing your sewer or septic system. keep your sewer system root free. a free camera inspection with a Rootx application. for the hazard severity panels. oils, and other organic materials build up in sewer and drain pipes. 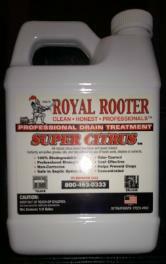 use of Royal Rooter Professional Drain Treatment. Do you have garbage disposal odors or bad drain odors? Super Citrus is great for odor control with it's citrus based scent. plumbing system-formulated to help prevent clogs. Apply once a month to kitchen, bathroom, shower, and other drains. running drains apply once a week until drain flows properly.